A corkscrew road ripping over Appalachian foothills in Pennsylvania works like a Formula One course to challenge both driver and car in tests we devised to sample the aggressive character of a sporty new sedan by Acura, the line of performance and luxury vehicles derived from Honda of Japan. 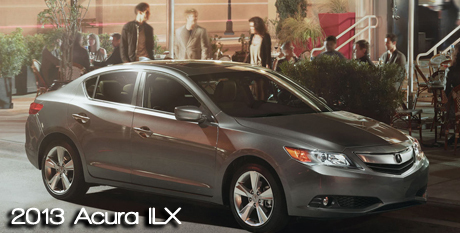 A trunk tag labels the new car as the ILX and Acura describes it as a new gateway vehicle to the brand offering sporty handling traits plus premium features and value on a luxury scale. Cast on a rigid chassis with a four-cylinder engine directing all torque to the two front wheels which also steer, the ILX stocks all of the hardware components to make a responsive sports sedan. Apply a tape measure to the ILX and the numbers reveal a package size fitting in the compact class with a wheelbase of 105.1 inches and wheel track width of 59.4 inches front and 60.3 inches rear, the car body stretching to 179.1 inches long, a body width of 70.6 inches and the roofline rising to 55.6 inches. Acura offers only one style for the ILX package -- a shapely 4-door notchback sedan -- but delivers three powertrain choices including the brand's first high-mileage gasoline-electric hybrid. To continue the review, click here. These are adjectives often lobbied Lexus’ way, and the company has tried to deflect them with cars like the IS and GS series, and more recently, the IS F.
While the IS and GS have certainly added some fun quotient to the lineup, they’ve been perceived as disappointing by the enthusiast crowd, and they haven’t quite hit the balance of sport and luxury that Lexus is looking for. Not to mention that they’ve been tight on interior space. 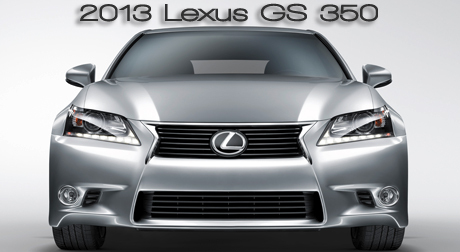 Lexus is looking to change things up with the next GS line, which launched in February as a 2013 model. While the V-6 carries over (more on that later) and the styling seems more evolutionary than revolutionary—although it’s still quite different—this new GS 350 is indeed a different ride than what it replaces. Let’s start with said V-6. It only gains a handful of ponies—up three to 306—and torque similarly rises by three on the 3.5-liter unit to 277 lb-ft. There’s no V-8 (at least for now. Maybe Lexus will release a GS-F at some point in the future. Pretty please?) but those who hunger for more power will like the 338-horsepower GS 450h. The hybrid gets a continuously variable automatic transmission (CVT) while the 350 has a six-speed automatic. All-wheel drive is available on the 350 (rear-wheel drive is standard) while the hybrid is rear-drive only. To continue the review,click here. We're whipping along the two-lane Empire Grade that slithers down slopes of California's Coastal Range to Santa Cruz on the Pacific Ocean in a test car with dramatic package styling and power to spare: It's the Volkswagen's 2013 CC. The CC slots into the mid-size class in configuration with a 5-seat cockpit and four doors for passengers plus a tail-side trunk bin. With its low roofline and integrated rear doors, the CC looks sleek like a curve-craving coupe that slinks snug against asphalt, yet it provides a pair of doors on each side like a family-friendly sedan with two rows of seats in the posh cabin and easy entry/exit for every passenger. It's as if designers for the German automaker Volkswagen tossed a coupe and sedan into a gigantic car blender and mixed ingredients until the sleek CC emerged. VW laces the CC with serious mechanical hardware which includes a strong engine (with options for a turbo four-pack or zipper V6), and electronics governing the vehicle's dynamic movements as well as communications, navigation, comfort, even on-board entertainment gear. To continue the review, click here. If you've ever been a bit late to catch on to a current fashion trend, you'll know how Nissan likely feels about the 2013 Pathfinder. Nissan is moving the Pathfinder from truck-type body-on-frame construction to a more car-like unibody crossover platform for 2013, following in the footsteps of its rivals such as the Ford Explorer, which underwent the same transformation for the 2011 model year. Oddly enough, Nissan was once actually ahead of the curve. This isn't the first time the Pathfinder has gone unibody--it did the same from the 1996-2004 model years. This time, though, the change seems likely to stick. Unibody construction offers a more car-like ride and better fuel economy than body-on-frame construction, and shifting consumer tastes (buyers are trending toward car-like ride/handling over boulder-bashing toughness) and rising Corporate Average Fuel Economy standards mean that crossover construction is likely to takeover the segment. Nissan may have joined the party late, but that doesn't mean the Pathfinder isn't trying to be fashionable. If you remember the Pathfinder fondly as a rock-crushing SUV with serious off-road chops, Nissan salespeople will gladly sell you an Xterra. The new Pathfinder is meant to be a family hauler (hence the seven-seat configuration), and it shows. To continue the review, click here. The steep slope on a rough trace cut across Oregon's rugged Coast Ranges presents a challenge for a four-wheeling test drive through tall timber in a new2013 Ford Explorer Sport crossover utility vehicle. Loose dirt and chat on the trail often causes even nubby tires like Explorer Sport's 20-inch P255/50R20 rollers to slip and skid on a steep descent, which in turn may propel the vehicle faster than prudent to maintain steady control for safe passage down the grade. No way that runaway momentum will occur with the new Explorer Sport, however, because it stocks sophisticated electronic controls linked to the all-wheel-drive (AWD) system as well as the anti-lock brakes (ABS) and Ford's AdvanceTrac electronic skid control (ESC) device with traction control and roll stability control (RSC), which measures vehicle motion on both the yaw and roll axes. And a new electronic safety device aboard is dubbed Curve Control -- it can detect when the driver runs too fast into a turn, then automatically deploy the brakes to slow and stabilize the wagon. But there's more: Explorer Sport totes a serious power package. It incorporates a unique direct-injection and twin-turbocharged V6 -- promising the fuel economy of a V6 but the power and torque of a big V8 -- labeled by Ford as the 3.5-liter EcoBoost V6. To continue the review, click here.